I finished work at 1pm and was looking forward to my first fishing session of the new year! I had a decision to make; go to the canal, or the river. After perch, or roach and hybrids, I was very undecided. The weather was very mild and good for either species, but I really wanted to catch my first perch of the year. The canal had been very clear of late and the perch which were still shoaling with the roach were spooking very easily. Anyway, I headed off down the Naas Rd. and it would be a toss of a coin if I turned off for the canal or went straight on towards the Barrow. Fate dictated I would carry on (good or lucky choice number one). I carried on towards the river and decided to fish a back water that had produced good bags of roach and good numbers of perch the previous weekend. I had plans to trot a stick float for roach and hybrids (if present) and introduce some chopped worm and casters throughout the session and try for perch later in the day. On arrival, I found about a dozen anglers in my chosen location so that put an end to that plan. I would have to fish a different section of the river (good or lucky choice number two). 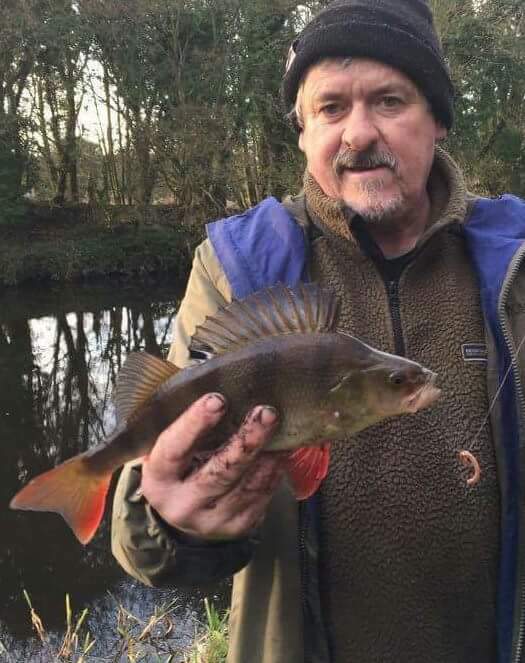 I headed back up the river towards a spot I had done really well on earlier in the year, catching lots of perch up to about a lb and a half and to eighty or so in a session. Mostly on dropshot, lures and worms. But also on small plugs and jogs when the weather was warm. By the time I had gotten to my new swim and set up the dropshot rod with perch in mind it was after 3pm and the day was getting away from me! There was one other angler present and he was pike fishing with some wonderful handmade fly lures. I had a good chat with him and discovered that he was a good friend of a good friend of mine (lucky incident number three). His name is Dawid Kopczynski, he informed me that he had been up and down through my preferred perch holes a few times and had had two jack pikes. But that there was no sign of any roach or perch and no fish topping whatsoever. We fished away for forty-five minutes or so, deep in conversation and I struggled to catch seven or eight small perch and one decent one of about a lb. none were in the same spot, which was not normal for the area and the reason was to reveal itself about 3.50pm. My companion had just said his goodbyes and was just leaving when I hit something just under the rod tip. At first it felt like a snag, but then it started to move slowly with the current and then against the current. I then shouted to Dawid that I might have something decent on and he came back (lucky episode number four). At this stage I should tell you I was using a 7’6” 0.5-7g dropshot rod, 8lb braid mainline, 6lb drennan supplex fluoro hooklength and a size 6 drennan dropshot perch hook and 3g dropshot weight. 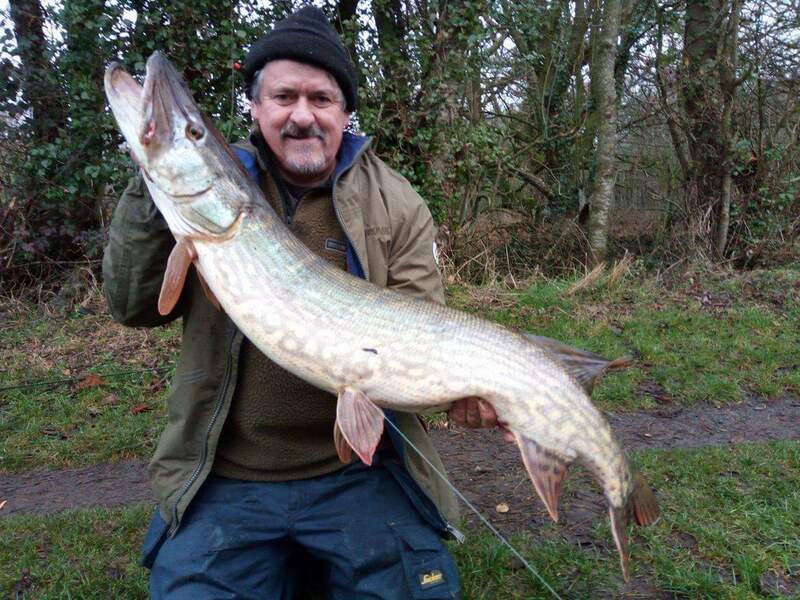 Fine for perch and the odd jack pike! I also had a net that would be fine for perch, tench, bream, etc. with a nice long handle but no use for what I was about to encounter. Fortunately, Dawid had a collapsible salmon net with a deep mesh (lucky again). Anyways, it wasn’t long before we realised I had a decent pike on (quite possibly a double) but it was hard to get a good look at her for a while. For the first five minutes or so, I never thought I’d land her, she would either bite the line or get snagged in the dense bankside vegetation! But as the battle went on I knew the hook must have had a good hold away from her myriad of teeth and also that she wasn’t only a double but possibly much bigger! After what seemed like an eternity with many runs, dives, swirls and rolls I had her close to the bank. Dawid got in position down the steep bank and had the net at the ready, I honestly thought we would only get one chance and when I drew what then looked like a crocodile over the net I was worried. Dawid did a brilliant job and placed the net downstream of the fish in a vertical position and I guided the pike head first into it. The only trouble was there was more of her outside the net than in! My now best friend, did a miraculous circling motion with the net and managed to get the pike’s body to follow the circumference of the frame and lifted her out onto the bank, putting her down onto some thick soft grass. We both gasped and voiced some expletives and shook hands many times! It was a great moment. Dawid quickly measured her, 108cm, definitely a twenty, while I readied the scales! 22lb 4oz! A truly fabulous pike on such light gear, I must thank my new friend for his excellent gillying skills. I would never have landed her on my own, what a start to 2017’s fishing adventures. It was great to see her swimming away strongly, to spawn in a couple of months and hopefully give someone else the same pleasure in the future. So there you have it, the one that didn’t get away! Was it luck, destiny, fate, the fishing gods smiling on me? In truth, probably a bit of them all. 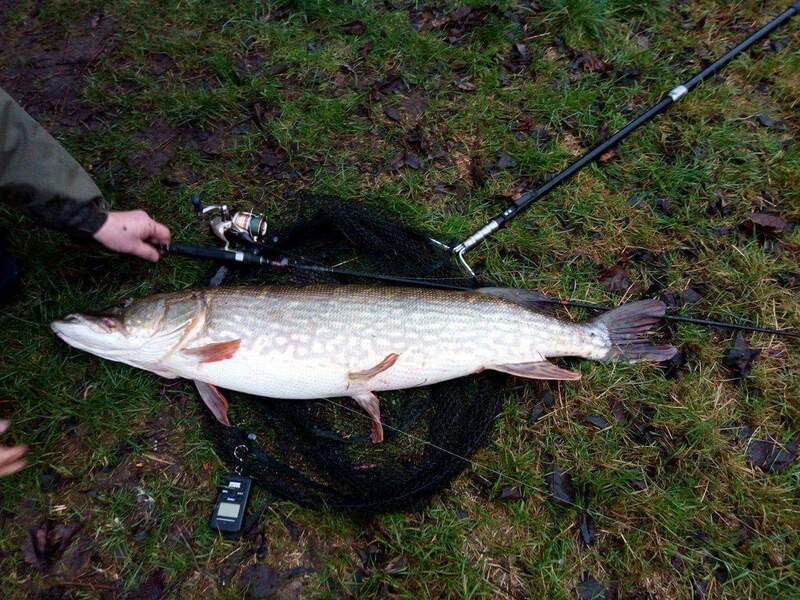 This entry was posted in Coarse fishing and tagged Alan Walsh, perch, Pike, the Barrow. Bookmark the permalink. Hey alan, its paul mulligan, been reading your blog here in oz, am back over late this year, catch up. My email is ozmulligan@yahoo.com. ooroo!